My First Post On Creary! 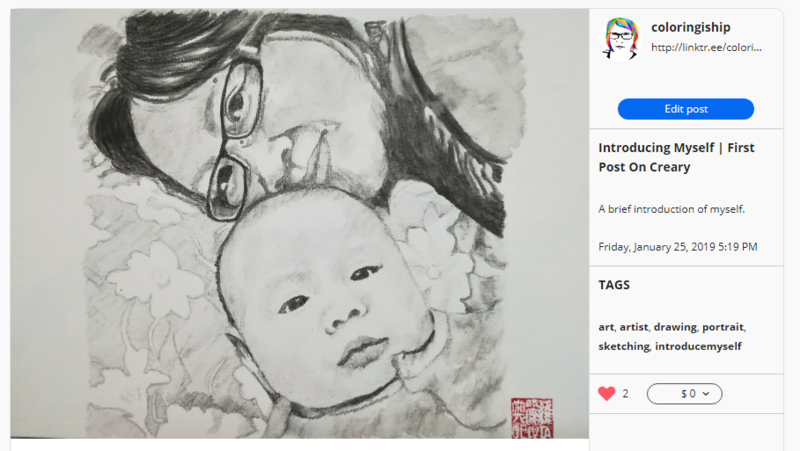 So I found a new de-centralized platform for me to share my art! Creary. I am so excited. I have been blogging over on Steemit for the past couple of years and it has been a very rewarding experience. And since then I am always on the look out for de-centralized platforms to share my art and make extra income. To my blog readers who are unfamiliar with de-centralized platforms, sites like Steemit.com or Creary use cryptocurrencies to reward publishers and curators on their sites. These rewards can be exchanged with fiat like USD and the exchange rates will depend on the current market. That is the simple explanation. There are a lot more things involved. Now, back to Creary. It’s still in Beta like Steemit. However, unlike Steemit, Creary is a social network for CREATIVES! I like that so much. Now we have a platform just for the creative people – artists, musicians, designers, sculptors, artisans etc. You can read more about this site here: Creary Beta – A Social Network for Creatives. Welcome to Creary! Thanks for joining the beta test. Soon we’ll make the official launch…Stay tuned! Thank you. Looking forward to the launch!